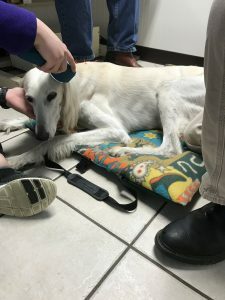 Abstract: A 12-year-old Saluki, with a history of seizures, was evaluated for acute pain and reluctance to move. Cervical pain was discovered in light of concurrent meloxicam and gabapentin therapy. The diagnostic acupuncture and myofascial exam (DAPE) indicated caudal cervical muscular pain and dysfunction that was not amenable to traditional pharmaceutical therapy. Trigger-point therapy, using acupuncture, was initiated at Bladder (BL) 10, 11, 12 and Gallbladder (GB) 21. After two treatments, one week apart, resolution of the initial symptoms ensued. Subsequently, a long-standing acupuncture protocol, utilizing dry-needling, electroacupuncture (EA) and photobiomodulation, was instituted as an adjunct to the current seizure therapy. History and Presentation: Burak, a 12-year-old, 31 kg, male Saluki, presented on August 1, 2017 for evaluation of pain and reluctance to move for four days. The owner noted that Burak cried when moving his head and yelped whenever he moved. The owner had been medicating with 6.5 mg of meloxicam daily for the previous four days with no observable relief. He was also receiving 600 mg of gabapentin three times daily and 60 mg of phenobarbital twice daily for seizure therapy of nine months duration. 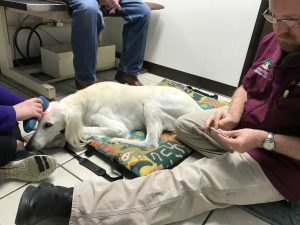 The owner reported that Burak consistently had a mild set of two to three seizures lasting 20- 60 seconds every month. He was fed a commercial ketogenic (low carbohydrate) diet and supplemented with an Omega 3-6-9 supplement. Burak was current on vaccinations and heartworm prevention, was negative for intestinal and ectoparasites, an d was negative for borrelia, anaplasma, and ehrlichia. A CBC, chemi•try panel, and T4 level were within normal ranges for a sight hound; and a phenobarbital level was within the therapeutic range. Radiographs were also unremarkable. Physical Exam: Examination revealed Burak to be painful, reluctant to walk, and he carried his head down towards the floor and his feet were positioned in a “sawhorse” stance. His blood pressure and heart rate were elevated (176/101 and 160 beats per minute respectively) secondary to pain. His body condition score was 4.5/9, mild tartar was present, he was panting and afebrile. A lameness exam was not performed and a brief neurologic exam was unremarkable. He refused to move his head and neck, and had tautness and trigger-points along the brachiocephalicus, omotransversarius, and cranial trapezius muscles bilaterally. DAPE findings indicated severe trigger-points at BL 12 and GB 21, _heat and sensitivity along the entire cervical r gion, and mild discomfort and heat at the atlanto-occipital region. Further diagnostics were declined at the time due to Burak’s pain levels and the owner’s unwillingness to allow sedation, as well as the lack of findings when previously performed. Differential and Putative Diagnoses: The differential diagnoses were separated into two categories, a category for concurrent seizure activity and a category for the presenting neck pain. Both categories of differential diagnoses were based on history, diagnostic findings and lack of findings, response and lack of response to existing treatments, and on complete (including routine, neurologic , and DAPE) exam findings. The differential diagnoses for neck pain included trauma, cervical instability, intervertebral disc disease, neoplasia, meningitis, discospondylitis, and autoimmune myopathy. The differential diagnoses for.seizures included neoplasia, epilepsy, meningitis , and trauma. The presumptive diagnoses were acute traumatic muscle inflammation secondary to idiopathic epilepsy. These diagnoses were made based.on the lack of other diagnostic findings in the past, anamnesis, signalment , and initial response to treatment. Medical Decision Making: Acupuncture was decided on as a diagnostic and therapeutic plan based on the concerns of the owner. This was based on the fear that using available pharmaceuticals, in the forms of alpha 2 agonists or opioids for sedation and analgesia, would lower the seizure threshold. The initial therapeutic plan was to use dry-needling at trigger-points to reduce local pain by stimulating muscle spindle receptors and allow the meloxicam and gabapentin, that were already circulating in the system, to be effective. The use of traditional autonomic modulating points was also included in the neuromodulation protocols. Additional treatments would focus on trigger-point therapy, and woufd use acupuncture points intended to increase parasympathetic tone by neuromodulation of the nucleus tractus solitarius in an effort to reduce seizure frequency and severity. This would be accomplished by stimulating the deep fibular nerve, lumbar spinal nerves, cervico-thoracic spinal nerves, accessory spinal nerves, trigeminal nerves and the upper cervical spinal nerves, all of which interact with and stimulate the vagus nerve. Acupuncture Treatments: The initial acupuncture plan was to stimulate the painful trigger-points with dry-needling at BL 10, 11, 12, and GB 2J and to modulate the autonomic system by dry-needling Governor Vessel (GV) 20, 14, 4, and Bai Hui. The following week, the same points were used for pain modulation. In addition, a neuromodulation protocol was incorporated for Burak’s seizures. This included photobiomodulation over the cranium to stimulate the reticular activating system using a Class IM Superpulse device incorporating wavelengths at 905nm, 860nm, and 660nm fluctuating between 1000 and 3000 Hz. Acupuncture points were also chosen to affect the vagal tone. These points were Yin Tang, Shishencong, BL 10, GB 20, and Liver (LR) 3. The third week, there was resolution of the cervical pain and trigger points. The neuromodulation plan centered around a seizure protocol utilizing photobiomodulation at the cranium and EA, utilizing the Pantheon device in a mixed mode of 4 and 100 Hz for 10 minutes, bilaterally from Stomach (ST) 36 to LR 3. Dry-needling was also performed at BL 10, GB 20, GV 20, 14, 4, Bai Hui, Shishencong, and Heart (HT) 3 (for anxiety). The future plan is to perform the seizure protocol weekly for one month and then slowly extend the treatments by weekly intervals until they are being performed every 4-6 weeks as determined by the owner based on seifure frequency and severity. Additional trigger-points will be treated as needed based on each DAPE evaluation. Outcome: Within ten minutes after placing the acupuncture needles into Burak on the first visit, he had relaxed and rested on his side. On the second visit, the owner indicated that he had seen an immediate result and stated that Burak had jumped into the vehicle after leaving the facility. The neck was more flexible and no pain or trigger-points were found on that visit. 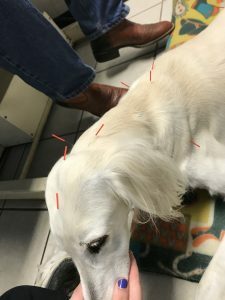 The owner was so ecstatic with Burak’s recovery from the neck pain, that he wanted to see if acupuncture and photobiomodulation would help reduce the frequency and severity of Burak’s seizures and help to reduce the phenobarbital dosage. By the third treatment, Burak was still improving with his musculoskeletal issues. His owner stated that he had caught Burak on the countertops multiple times that week. He also stated that Burak had a set of seizures just two days prior, which had been expected based on the monthly seizure cycle. We are currently following the prescribed acupuncture protocol for his seizures.